Successful bird control starts with a thorough cleaning of the installation surfaces. All installation surfaces must be clean, dry and free of debris before you install any type of control. Always clean the surface first! Protect your health and property. Sucessful Nixalite installations start with clean surfaces! Protect your health: Pest bird and animal waste can contain hazardous diseases, bacteria and parasitic organisms. Thoroughly cleaning, disinfecting and deodorizing the surface helps protect anyone that is on-site before, during and after an installation. Protect the Property: Left undisturbed, bird and animal waste can destroy almost any building material. 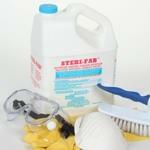 Wood, stone, steel and iron are all susceptible to the acidic and bacterial ridden mess. If allowed to accumulate, it can clog gutters, discolor paint, corrode I-beams, ruin cloth awnings and short out electrical equipment. Eliminate the Scent Trail: Birds and animals are drawn to the scent of their own waste. Thoroughly cleaning and deodorizing installation surfaces eliminates this scent trail and discourages pests from following the scent back to their old roosts. 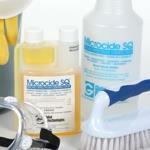 Nixalite Cleaning Products offers products for every surface cleaning to ensure successful installations. Bird droppings can be hazardous to your health. The following guidelines list the minimum precautions that should be taken. If the surface/area has a heavy accumulation of bird/animal waste or if the area is enclosed, we highly recommend contracting a professional waste removal company to prepare the surface for installation! Wear a minimum of protective gloves, eye protection and a respiratory mask to guard against harmful bacteria and parasites that may be present in the bird or animal wastes and refuse (nests, dead birds and animals, surface debris, etc.) Nixalite offers a variety of personal protection equipment including 3M Respirator Mask, Nighthawk Disposable Gloves, and Splash Goggles. To enhance personal protection and safety, use the Microsan anti-bacterial soap and lotion to help prevent disease transmittal before, during and after working around surfaces contaminated with bird and animal wastes. After treatment with the cleaning agent, remove the neutralized waste, refuse and debris from the surface. Follow all city, state and federal regulations regarding the proper removal and disposal of bird and/or animal droppings, wastes and refuse. Wash the surface thoroughly to remove any remaining filth. Treat the surface a second time with the cleaning agent to remove any remaining bacteria, germs and odors. 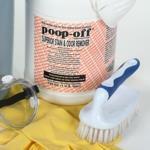 The end result must be a clean, dry and odor free. The surface is then ready for the installation of the bird or animal control system. After the surface is clean, dry and free of debris, you are ready to begin the next steps for installing the product or system you have chosen.